What a lekker day on the bay! 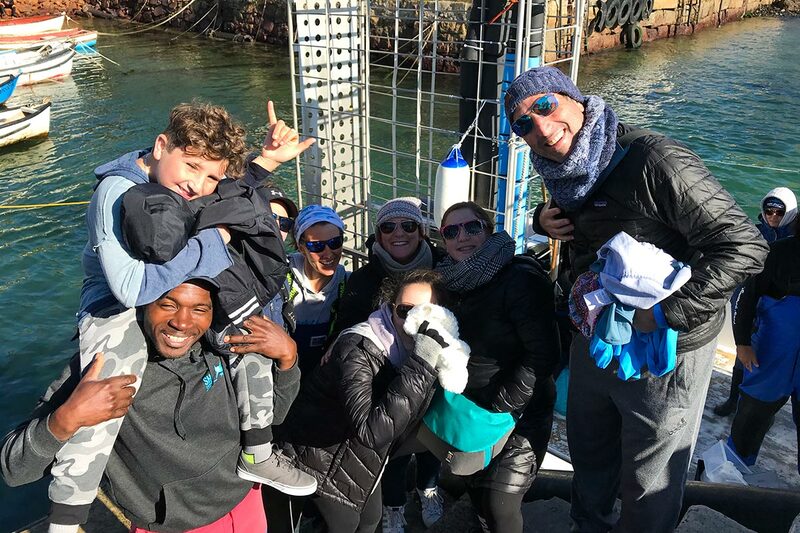 The white shark cage diving action in False Bay is heating up, with no fewer than five sharks coming to investigate us at the cage today. As the orange glow began to lighten the sky in the east, we were already on the water making the most of a stunning winter’s day. Despite ideal hunting conditions in the low light, the sharks were not in the mood for launching aerial breaches on seals. The decision to anchor early on the reef paid off. Our first great white shark visited us while the clients were still donning their seal costumes! From there the action got better and better. A hugely curious juvenile shark continuously returned to the cage, eyeballing everything from the baits to the boat to the people in the cage. At 1.4m he is the smallest shark we have seen this season, and it was such a pleasure so see this baby fearlessly investigating this strange new environment. At the other end of the scale, the 4.7m shark that cruised into view was the epitomy of grace and power in the water. He swam within a hair’s breadth of the cage, giving our thrilled clients up close and personal views of the ocean’s most iconic predator. Even more impressive, the youngest client to brave the frigid waters for a look was only six years old! He actually managed to bully our dive master Ernest into the cage with him – only the second time ever in eight years. After all this toothy, sharky pleasure, our journey home had one more delight in store. Spotting movement on the horizon our tall, dark and handsome skipper veered off course to reconnoitre. The crests of white water turned out to be a pod of Common dolphins 800 strong! We circled close by the group, while they hunted, played and jumped joyfully in our wake behind the boat. Our clients left with cameras full, faces smiling and epic memories to take home.